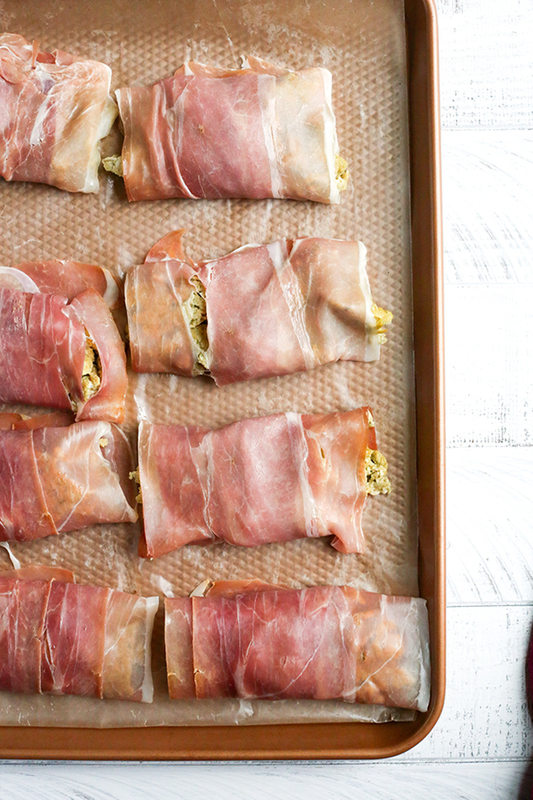 These Paleo Whole30 Pesto Prosciutto Egg Wraps are a fun, handheld breakfast. 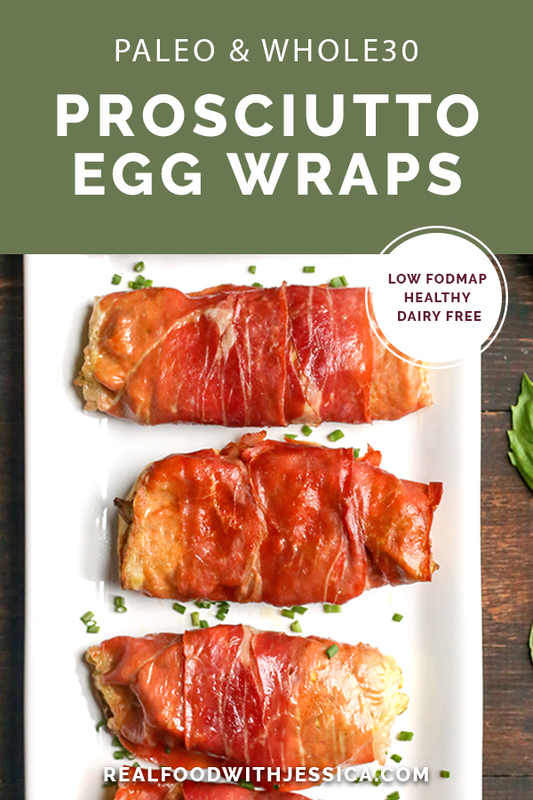 Tender cooked eggs wrapped in crispy prosciutto making a healthy burrito. They are gluten free, dairy free, low carb and low FODMAP. I came up with this idea when I noticed my husband needed breakfast the next day and I didn’t feel like cooking the usual breakfast casserole. We had pesto already in the fridge so I mixed that up with the eggs. 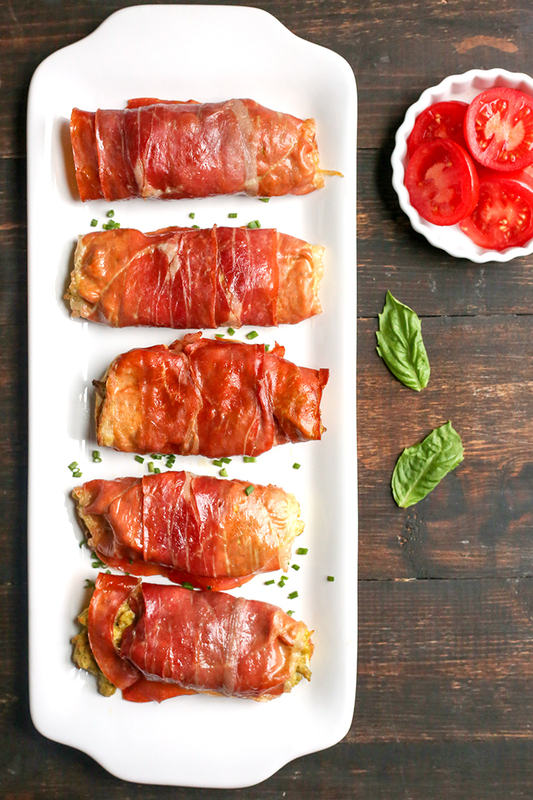 Layer out the prosciutto and wrapped the eggs in it, like a burrito, or enchilada since I don’t tuck the ends. They came out amazing and I’ve made them a few times since then. We just bought an air fryer so I thought that would work to warm them up in the morning and they came out better than expected. Super crispy in under 10 minutes. Since I know not everyone has an air fryer I also include oven directions. It does take longer in an oven, but still easy and worth the extra time. These are great for meal prep or for when you have company over. It feels a little fancy and you can make them ahead and just warm them up in the morning. Serve with some fruit and veggies for a complete meal. 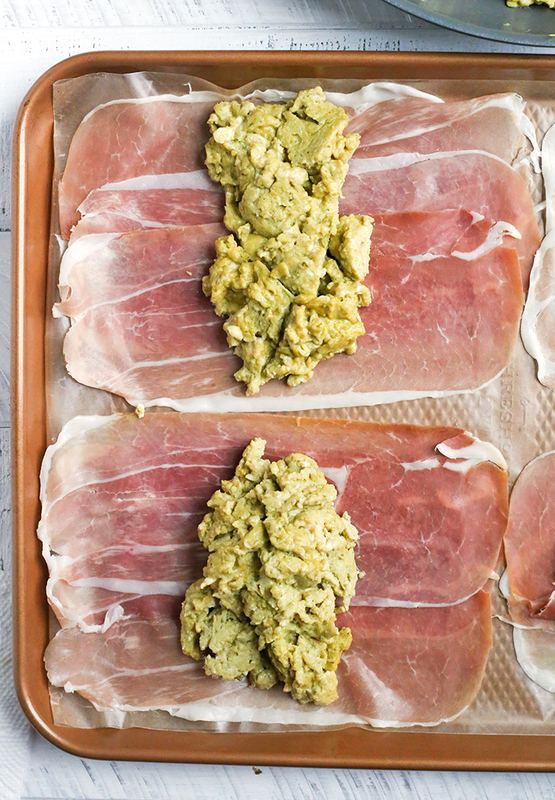 I included some step-by-step pictures for this so you have an idea how to lay out the prosciutto and wrap them. 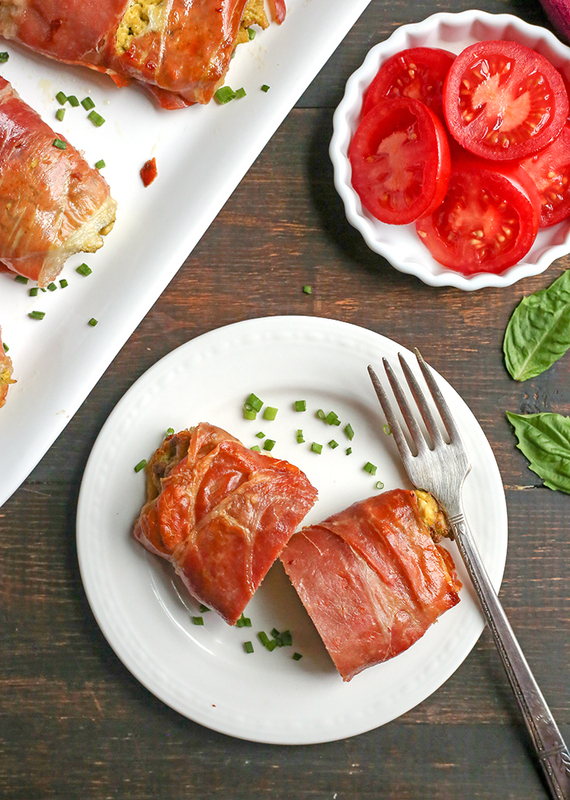 You can technically eat them like this since the prosciutto is fully cooked, but they aren’t crispy. 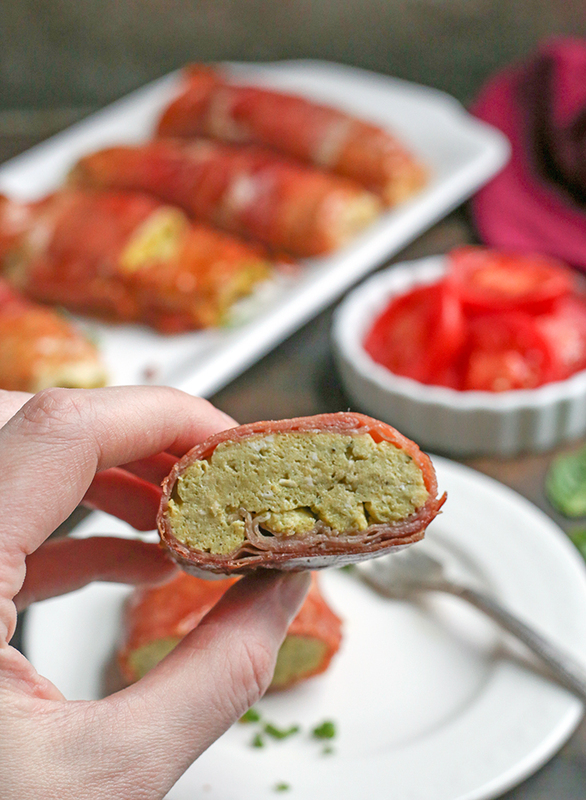 These are low FODMAP as long as you use a low FODMAP Pesto. It’s easy to make and can be prepared ahead of time and stored in the fridge. Some more breakfast recipes you may enjoy: Paleo Whole30 Sausage Gravy and Paleo Whole30 Sweet Potato Hash. Crack the eggs in a large bowl and stir in the pesto. Whisk until well combined. Add ghee (or preferred fat) to a large skillet and turn the heat to medium. Pour in the egg mixture and cook until done, stirring regularly, about 5 minutes. Take off heat. Line a sheet tray with parchment paper. Lay 3 pieces of prosciutto together, slightly overlapping to form a tortilla-like base. You should get 8 total. Divide egg mixture evenly between all the prqoscuitti wraps. Fold the meat around the eggs and lay seam side down. Cook in an air fryer for 8 minutes, flipping half way through. (For this I lined a 8x8 pan with parchment paper and placed them on that.) OR Preheat the oven to 375° and bake 16-18 minutes, flip over and bake 5 more minutes. These can be prepared and baked the morning of serving.